Thread: Diamond pattern, bi component. ease the subsequent gluing procedure. Even taking care with this procedure, the temporary fitting requires patience because the tubular seems of a smaller diameter than the rims. Fortunately, with some strength, it fits. Once this first step is done, the final gluing is easier. 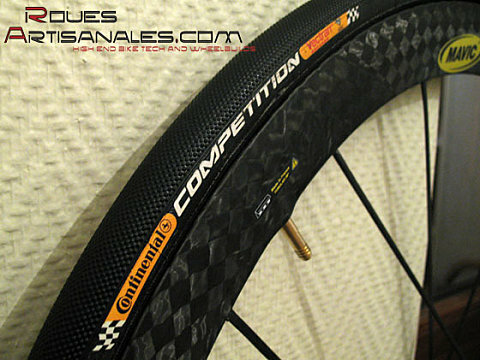 the racing or riding condition, this tubular always provided a very good cornering grip. effective. In terms of wear, these tubular are also amongst the best. With my 73kg, the diamond tread pattern disappeared after 1,000-1,500 km. We can expect a life of 2,000km. light and this is likely another reason why a lot of famous pro riders and racers use them.